Ever find yourself happily going about your day, using Picard and/or GATK when all of sudden a dreaded ERROR message is output instead of your tidy SAM/BAM or VCF file? Even worse, you try to diagnose the errors using Picard's ValidateSamFile tool and the command-line output is... shall we say, "incomplete"? Well, take comfort because we have just the right medicine for you... new documentation for Picard's ValidateSamFile tool! 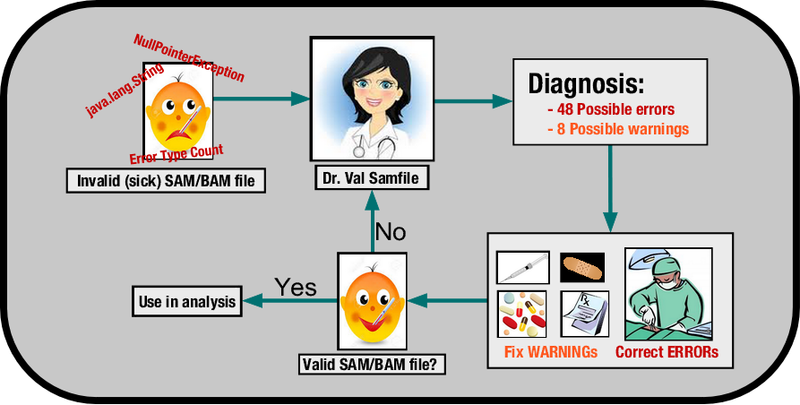 This document will guide even the most novice of users through the steps of diagnosing problems lurking within their SAM/BAM files. Not only that, for the first time in the history of the world, we present tables listing and explaining all of the WARNING and ERROR message outputs of this program! Woohoo!!! Now you can effectively troubleshoot your WARNING and ERROR messages by running ValidateSamFile prior to feeding your SAM/BAM file into Picard and/or GATK.